Where will we find our strength to go on? Earlier this fall the Atlantic Life Community held a Labor Day weekend retreat at the Romero Center of St. Joseph’s Parish in Camden, New Jersey. Camden, scorned among many other great, fallen American cities, struggles to regain it’s dignity and right means of livelihood after moving from a war economy of the shipyards in the 1960s to very little economic opportunity today. The state has taken over failed school systems and local government from the people here. Yet we were heartened by the attempts of both St. Joseph’s and Sacred Heart parishes in the rebuilding and reclaiming of their neighborhoods. Art Laffin, Bill Frankel-Streit, Chrissy Nesbitt and Nancy Gowan went to court on October 22 for their August 6 arrest at the Pentagon. The following report is from Art Laffin. Thank you so much for your prayers as we once again went before the court to proclaim the Gospel of Nonviolence. Bill and I were prosecuted, while Chrissy and Nancy had there charges dropped due to no previous convictions for Pentagon protests. 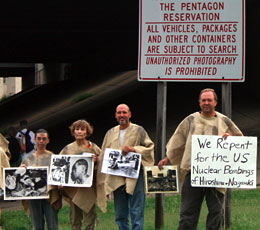 Seven nuclear abolitionists, arrested for trespass last August as they sat in front of the locked gate of a plutonium processing facility at the Los Alamos National Laboratory (LANL), will plead their case to a jury picked from residents of Los Alamos, New Mexico, where The Bomb was born. At a pretrial hearing October 21 in Los Alamos Magistrates Court, Magistrate Pat Casados set a trial date of Tuesday, February 8, 2011 for seven of the eight people arrested last August 6, the 65th anniversary of the bombing of Hiroshima. Defendant Elias Kohn, a student at the University of Southern California, pled no contest and was sentenced to 60 days probation and fined $500. The judge found me guilty. Even after I’d testified under oath that I had committed no crime when standing in front of a bulldozer in a muddy soybean field being cleared for the new Kansas City Plant, arm in arm with 13 others. 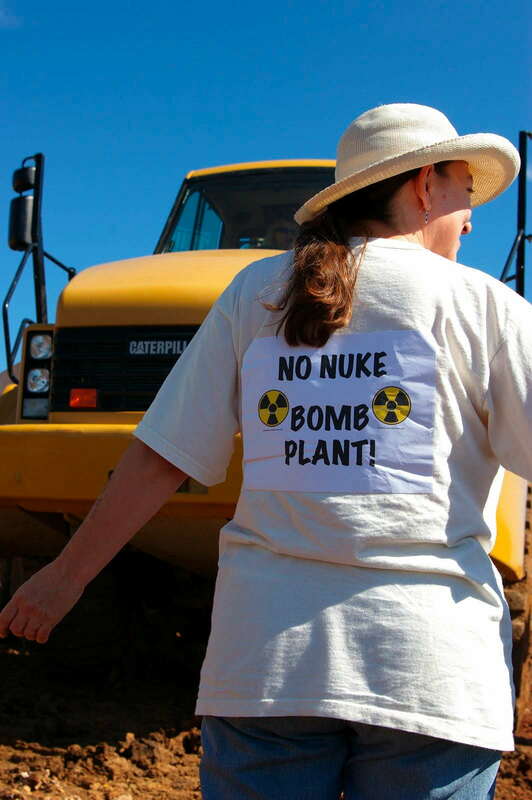 On August 16, we had tried to stop preparation of the site for the first U.S. nuclear weapons plant to be built in 32 years. That’s what brought us to Judge LaBella’s Kansas City courtroom on October 7. Joan Staples, Director of the Tahoma Indian Center, blesses the five Disarm Now Plowshares before their arraignment. Photo by Leonard Eiger. 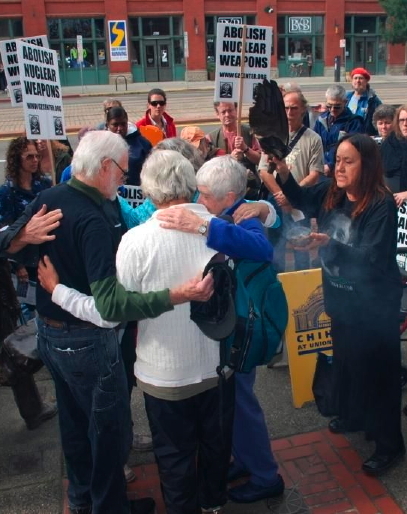 Five nuclear abolitionists who entered the U.S. Navy’s nuclear weapons storage depot in Washington State in November 2009 were arraigned Friday, October 8 in federal court in Tacoma, Washington. Fourteen people who blocked heavy machinery clearing the site for construction of a new nuclear weapons factory in Kansas City, Missouri, were convicted and sentenced to fines and community service. Two of the defendants then disrupted a Kansas City council meeting, unfurling a banner and calling on the city to stop its investment in building for nuclear war. Frank Cordaro and Ed Bloomer were jailed overnight, then sentenced to time served. The following reports are from the Kansas City Star , National Catholic Reporter and Jane Stoever of PeaceWorks, Kansas City and the Kansas City Peace Planters.